Come join me for my restorative yoga. In this one hour class we will work on the connective tissues that responds best to a slow, steady load which is why we hold the poses for longer. If you gently stretch connective tissue by holding a pose for a long time in this way, the body will respond by making it a little longer and stronger - which is exactly what you want. Remember, the principle of exercise is to stress the tissue so the body will respond by strengthening it. Come join me for my birthday and some restorative yoga. In this 1 hour class we will target our deepest tissues of the body, our connective tissues — ligaments, joints, bones, and the deep fascia networks of the body. It helps to increase circulation in our body, improves our deeper flexibility, calms the mind and much much more. Come join me for my weekly Yin candlelight yoga class. In this 45 minute class we will target our deepest tissues of the body, our connective tissues — ligaments, joints, bones, and the deep fascia networks of the body. It helps to increase circulation in our body, improves our deeper flexibility, calms the mind and much much more. Join me for an all levels vinyasa flow class at Heal One World. A fitness-based approach to Vinyasa style flow. Students will focus on linking conscious breath with a vigorous and mindful flow. In a power yoga class, students will build strength, flexibility and concentration while cleansing the body and calming the mind. This well balanced flow class will get you out of your head and into your body and your breath; modifications always welcome. Bernice (www.hellobernice.com) is a licensed yoga teacher in the style of Vinyasa and Yin. She is also licensed in reiki 1 and massage therapy. This summer she traveled through India, Africa, and Australia, staying in various ashrams, teaching and improving her practice. She looks forward to teaching you what she's learned at this corporate wellness month. All level Vinyasa is a mixed-level class and an energetic, flowing series of postures that are synchronized with the breath. Every practice is intended to be a complete experience, leaving you centered, grounded, and refreshed. The variations of Yogic poses will be instructed to the sounds of music to help you connect your breath and soar through the poses. All levels welcome. Come join me at the beautiful Fauve Yoga studio in Santa Monica as I sub for Yogi Maha. This class will be taught in Power Yoga Flow style, which is a practice that strengthens and invigorates the body. This is an all level class featuring a series of flowing series of postures that are synchronized with the breath. Every practice is intended to be a complete experience, leaving you centered, grounded, and refreshed. This class will encompasses strength, balance, flexibility, stamina and detoxification, all within the context of a seamless, unbroken flow that links breath with movement. Join Bernice (www.hellobernice.com) a licensed yoga teacher a Memorial Day yoga special at With Love Market and Café Monday, May 28th at 9am. Start your day off with a yoga class to reduce stress, build muscle, and open yourself up to some self love. This will be a great way to meet other local yogis and share in each other’s practice. 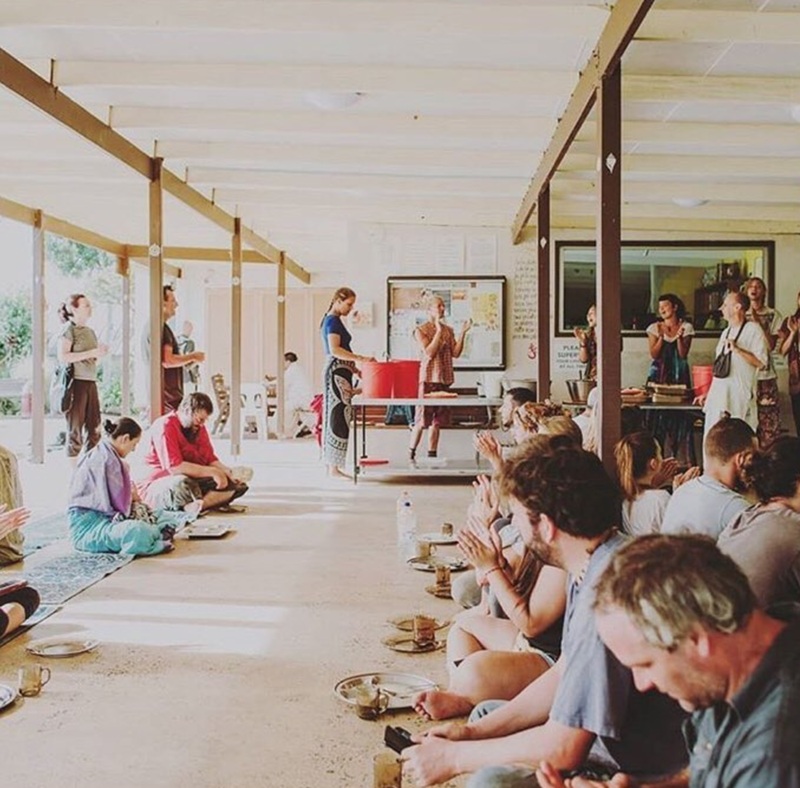 Claudia and I will be co-teaching at the Krishna Village! Join us, Bernice (Hellobernice.com) and Claudia (chasingclaudia.com) for an energizing vinyasa/power flow in the Park. We co-teach so we can give students hands on adjustments while leading students in the class. This is a 60 minute class and all levels are welcomed. 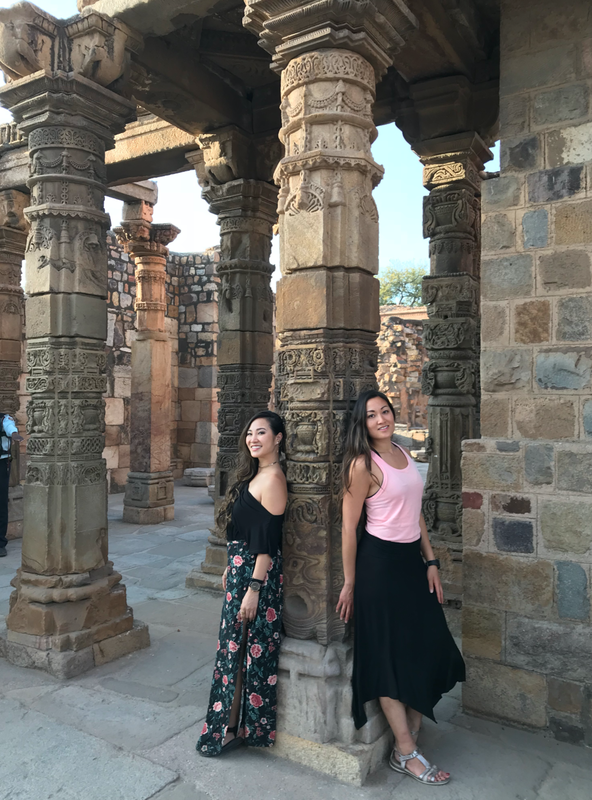 We are both licensed yoga teachers from Los Angeles, California and we look forward to teaching you on our visit to Johannesburg! Please bring a yoga mat and water. If you have a yoga block you are welcomed to bring it. Class is donation based, zero pressure. Location: Emmarentia Botanical Gardens, South Africa. Join Bernice www.hellobernice.com and Claudia for free yoga in the park. This workout is designed for those that love being outside, being active, and of course doing yoga. This will be a great way to meet other local yogis and share in each other’s practice. You can learn so much from a new friend and with hands on adjustments! Whether you are new to yoga or an experienced yogi, you'll enjoy the beauty of Hotchkiss Park while moving through fun vinyasa flows. Expect to sweat, laugh, and possibly make some amazing new friends. Class will be roughly 60 minutes. All levels welcomed. Please bring a mat and maybe even a friend. Join me, Bernice (www.hellobernice.com) this Thursday at 6:15am as I sub for Yogi Maha at Bryan Kest's world renowned Santa Monica Power Yoga & Meditation studio. Wake up and invigorate your body, clearing your mind and feeling centered so you flow through the rest of your day with ease and finesse. My teaching style is a Holistic Yoga Flow that strengthens and invigorates the body through power vinyasa. Power vinyasa encompasses strength, balance, flexibility, stamina and detoxification, all within the context of a seamless, unbroken flow that links breath with movement. Join Bernice (www.hellobernice.com) a licensed yoga teacher for free yoga in the park. This workout is designed for those that love being outside, being active, and of course doing yoga. This will be a great way to meet other local yogis and share in each other’s practice. Whether you are new to yoga or an experienced yogi, you'll enjoy the beauty of Hotchkiss Park while moving through fun vinyasa flows. Expect to sweat, laugh, and possibly make some amazing new friends. Class will be roughly 60 minutes. All levels welcomed. What to bring: Please bring mat, water, and maybe even a friend! 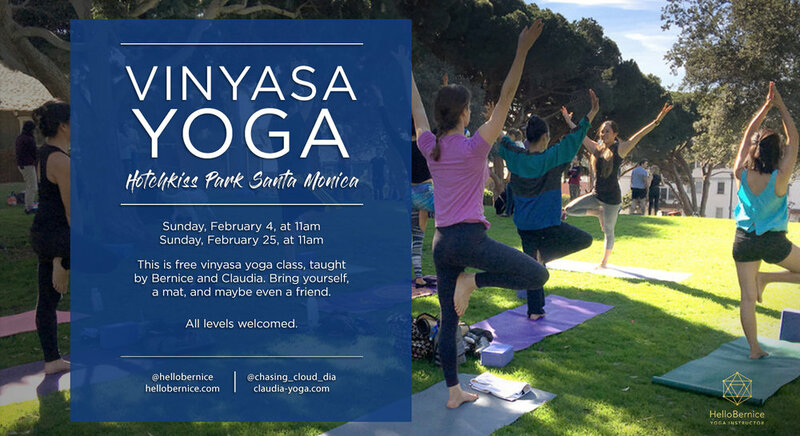 Join Bernice (www.hellobernice.com) and Claudia (Claudia-yoga.com) for free yoga in the park. This workout is designed for those that love being outside, being active, and of course doing yoga. This will be a great way to meet other local yogis and share in each other’s practice. You can learn so much from a new friend or have a completely private 1 on 1 class, with hands on adjustments! Class will be roughly 60 minutes. All levels welcomed. Please bring mat and water. Due to popular demand we're creating a second website date! Come over to my place on Saturday, February 3rd from 12-5pm with your laptop and a potluck dish. 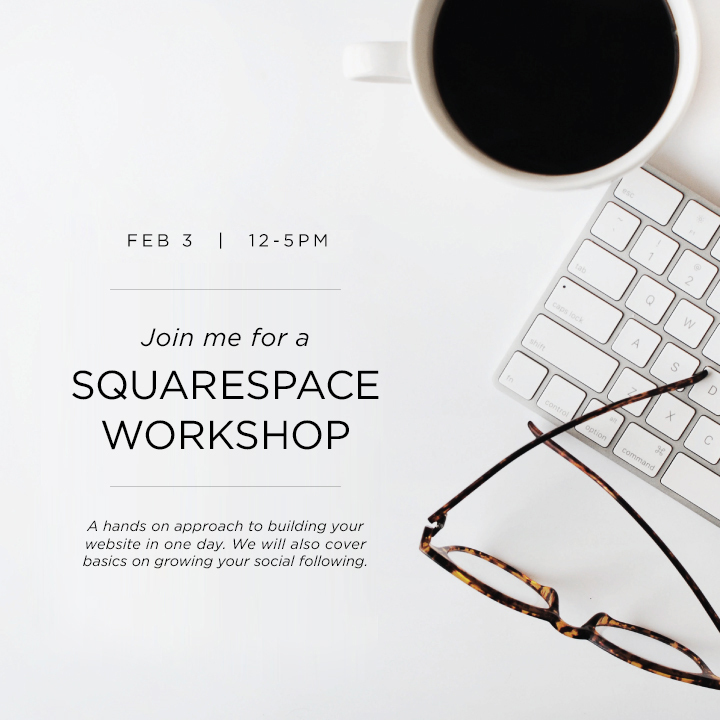 I'll go over how to send up a Squarespace website and some basics I learned on how to grow your social media following. First 6 people to RSVP. 2302 4th Street in Santa Monica. Bring yourself, a mat, and maybe even a friend.